What do a little known public speaking coach and a world renowned TV writer have in common? They agree on how to really overcome fear of public speaking actually transforming it into the power to speak authentically! For over 30 years, Sandra Zimmer has been evangelizing about what you really have to do to overcome and transform stage fright and fear of public speaking. Sandra’s solution to fear of public speaking came from what she had to do to make herself comfortable speaking to groups. Partly because she suffered horrible stage fright and partly because she earned degrees in psychology, acting and metaphysics, she had the intuition to figure out how to help herself and others release the tension and really overcome fear of public speaking. One of Sandra’s seminal learning experiences happened when she was speaking to a group of professional speakers. Sandra was invited to speak at the Houston Chapter of the National Speaker’s Association meeting. She was scared, but she said “yes” to the opportunity. She set about writing and practicing what she thought was a brilliant talk designed to impress the members. In the early predawn hours the morning of her speech, after not sleeping a minute, she bolted from bed, exclaiming out loud, “I can’t give this speech!” he realized she could not give that speech because it wasn’t authentic. It wasn’t true to who she was. She quickly rewrote the speech to simply share how she had created a way to transform stage fright. In seconds, she felt the tension drain from her body and she began to receive the flow of attention from her audience. She felt her body and mind open to radiate the energy of love as she relaxed into the presence to be with those listeners. Then she shared 15 minutes of her original ideas and insights. Not only did she receive a standing ovation, but the president of the group said he had never experienced that quality of energy at an NSA meeting. 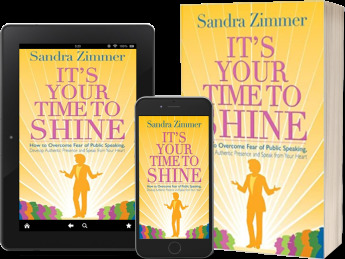 In 2009, Sandra published her book It’s Your Time to Shine: How to Overcome Fear of Public Speaking, Develop Authentic Presence and Speak from your Heart where she laid out the steps for being real with audiences and listeners. In 2011, she made a video to tell people the truth about what you really have to do the overcome fear of public speaking. You can watch her video. You’ll see she is kind of edgy because she was taking the risk to share the truth at a time when no other public speaking coach was being this honest about what you have to do to really overcome fear of public speaking fear. In 2014, Shonda Rhimes the creator of several hit ABC TV shows including Grey’s Anatomy, Scandal and How to Get Away with Murder, was invited to give the commencement speech at Dartmouth College, her alma mater. Shonda did not want to give that speech. She was terrified to give that speech; but she said “Yes” and wrote what she thought was a brilliant, witty speech. On the plane to Dartmouth, she read over her speech and realized she could not give that speech, because it was not authentic. It wasn’t who she was! Shonda quickly scribbled a new speech that was much more a reflection of who she was as a person. As she opened her speech, Shonda Rhimes did exactly what Sandra Zimmer had recommended in her book and video. She confessed to feeling terrified of public speaking. She shared just how scared she was. And magic happened! For the first time ever, Shonda transformed her fear of public speaking by being real with her audience. In her terms, she neutralized her fear by sharing it with the audience. Watch Shonda’s 2014 Dartmouth Commencement Speech. For the record, Sandra doesn’t know Shonda and Shonda doesn’t know Sandra; so Shonda wasn’t taking Sandra’s advice. Shonda stumbled on the same technique that Sandra had intuited way back in 1988. For both women, their souls urged them to just be honest. For both, there was no other choice that felt genuine. What Sandra and Shonda both took the risk to do, what Sandra has taught for 30 years and what Shonda brilliantly shared in her speech with millions of readers and viewers is to tell the truth about your fear of public speaking. Both discovered it makes you authentic with audiences. It transforms the tension and anxiety into a feeling of ease, flow and freedom to speak from your heart. Once you are not pretending to be something you are not, you can truly be yourself anytime you speak. The feeling seems magical. Being authentic about your feelings triggers the flow state where you feel your best and can perform your best. It’s as though you open the doors and windows to your soul. You no longer have to hide anything so you are free to speak what is in your heart and mind. You find your voice and because your voice is authentic; and, you can be brilliant. Sandra Zimmer has been coaching professionals to speak authentically since 1989. She has been encouraging professionals with stage fright to stand in front of their group and feel, really feel the tension that happens inside their bodies at the center of attention. Then, she guides them to express out loud the truth of what they feel. What happens next is so amazing that it seems magical. Just like Shonda’s experience in her Dartmouth speech, their tension dissolves into the air, their heart rate calms, their gut relaxes and legs stop shaking. All that tension goes into flow and people feel comfortable to be who they are in front of the group. Soon they feel safe to speak freely to the group. Ideas, insights, stories and expertise effortlessly stream out of their mouths. Sometimes, they don’t want to stop speaking! You can learn more about the Sandra Zimmer Method at www.self-expression.com or www.SandraZimmer.com. If you feel stage fright or public speaking fear, read Shonda Rhimes’ book Year of Yes. You can read the whole story of Shonda’s speech and how it helped change her life. Oh yes, in case Shonda reads this post, Sandra begs her forgiveness for shamelessly using Shonda’s experience to highlight her own work. Reading Shonda’s story of transforming public speaking fear was just too amazingly similar to pass up the opportunity to connect their experiences. Sandra hopes that they may give readers the courage to just be real when they speak.